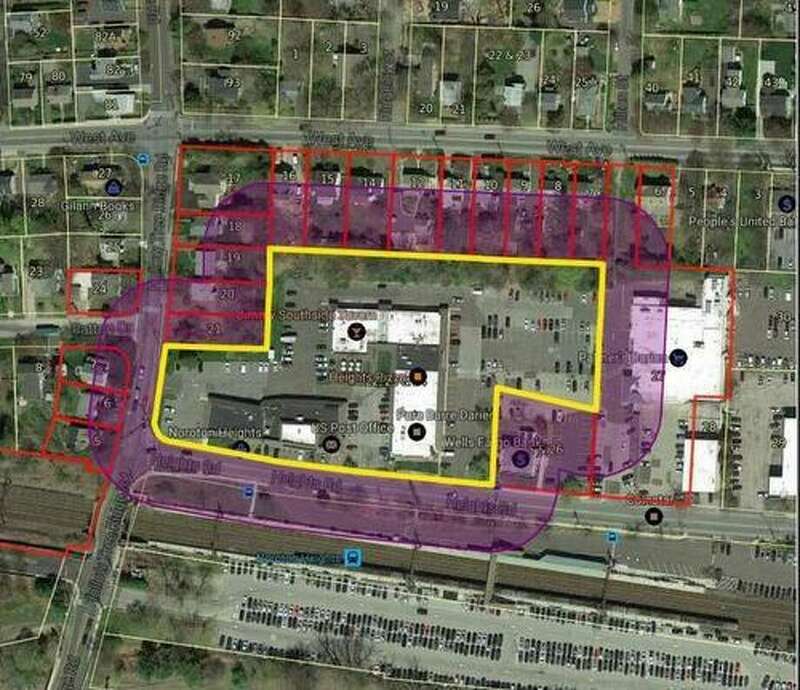 The area, inside the yellow, of the current Noroton Heights in which Noroton Heights Shopping Center, Inc., seeks to redevelop. DARIEN — With the public hearing and deliberations closed, half of the Noroton Heights redevelopment plan seems to be heading toward a positive decision for the developer. The Planning and Zoning Commission met Aug. 10 for the first time since the hearing was closed in July to discuss the merits of an application by Federal Realty that, if approved, would allow the company to amend the town’s zoning regulations and build slightly smaller parking spaces in the area, as well as become part of the Noroton Heights Redevelopment Overlay Zone. “I think we as a commission addressed this pretty exhaustively,” said Commission Chairman John Sini. He said the biggest objections expressed during the public hearing and via emails from residents had to do with density, flood management and parking — though he felt each concern had been adequately addressed by the applicant. “Residential density falls below the levels set by a previous commission,” Sini said. Federal Realty seeks to build 122 residential units — 67 of which would be one-bedroom, 55 would be two-bedroom — at a maximum of 1,200 square feet in the area where Stop & Shop and Walgreens are located. Those buildings, and others, will be razed. The buildings occupied by Citibank, Chase Bank and Equinox will remain. In terms of flood control, Federal Realty and Palmer’s Market — which will redevelop the western side of the Noroton Heights Shopping Center — showed the commission a willingness to work together and mitigate damage in what has been a problematic area that sits at the bottom of a 125-acre watershed. “There’s nothing there now, and from the get-go we talked about them doing as much as they possibly could. And I think they’re doing as much as they possibly can,” Commissioner Stephen Olvany said. The developers have offered to build a subsurface concrete structure that could hold a volume of 4 water acres — the amount of water needed to fill an acre at 1-foot depth — and that could cut flooding by an estimated 44 to 46 percent. Federal also intends on building 512 parking spaces, 215 of which would have a dedicated residential use, with dimensions slightly reduced (9 feet by 18 feet) from town regulations (9 feet by 20 feet) — a change first requested by Baywater Properties for its Corbin Drive redevelopment. “I hate that we’re approving massive amounts of parking without having tried it,” Commission Vice Chairman Eric Voigt said, though the other commissioners didn’t express similar dissent. The commission will continue deliberations and review a draft approval at its Sept. 5 meeting.